Don’t let your guests beverages ruin your dining or living room furniture. You need a fun and stylish set of coasters that will keep them chuckling while they save your tables from watermarks. 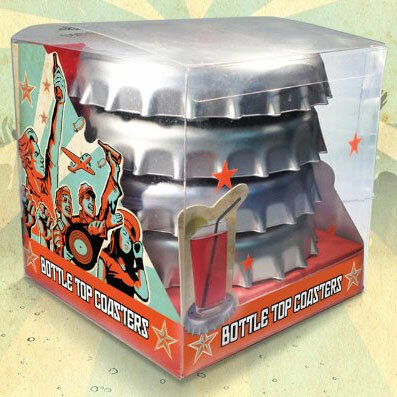 The Bottle Top Toasters are plastic and shaped like the tops from your favorite brews. Simply place your beverage on the coaster and keep your furniture in good shape. These clever coasters make the perfect gift for beer enthusiasts and bottle cap collectors. 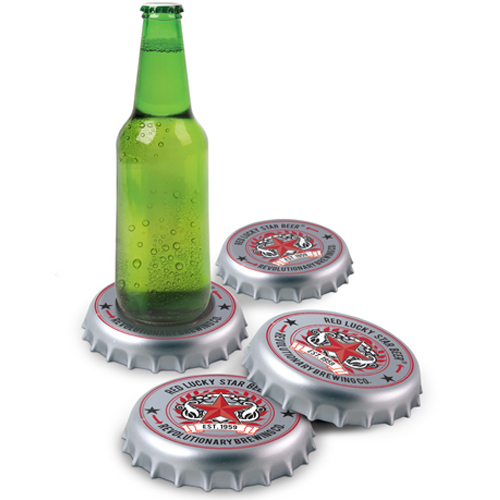 Bottle Top Coasters will be a hit at your next party and your furniture will survive the night too! There’s nothing more refreshing than a cold bottle of beer, but those rings are unsightly. That’s why we love, Bottle Top Coasters. They’re stylish and they keep the furniture safe. It doesn’t matter if you like domestic or imported, beer or near-beer, the Bottle Top Coasters will liven up your adult beverages.